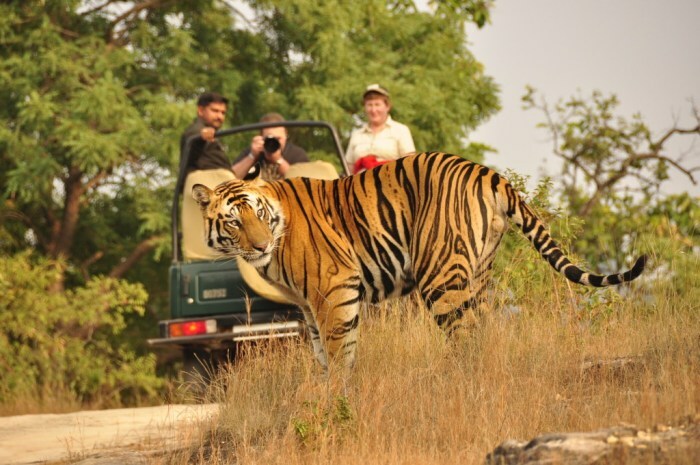 Jim Corbett National Park is India’s oldest and most prestigious national park. It is, basically, a tiger reserve which works under an initiative ‘Project Tiger’ to protect the endangered species of Bengal tigers. The park was established in the year 1936 as Hailey National Park, but then, it was given its current name after a famous hunter-turned-conservationist, Edward James Corbett (Jim Corbett). 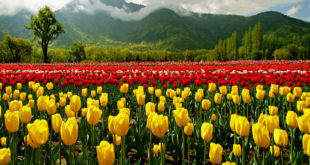 The park, covering an area of 520 square kilometers, lies in the district of Nainital, Ramnagar, Uttarakhand. The area of this wildlife reserve is so large that it covers different terrains like hills, marshy depressions, riverine belts, grasslands and a large lake. These land terrains could be enjoyed perfectly by a safari tour throughout the different zones of the park. The park offers three ways for safari tours across its area, that are, Open Jeep Safari, Elephant Safari and Canter Safari. According to the tourism activities, the park is divided into five ecotourism zones – Dhikala zone, Bijrani zone, Jhirna zone, Dhela zone and Durga Devi zone. Each zone has its individual topology, flora and fauna. These zones can be reached by crossing their respective entrance gates. Dhikala Zone : This forest zone is the most popular and the largest among all. This zone can be reached after crossing its entrance, the Dhangari Gate which is 32 kms from Ramnagar. This is considered as the best zone for sightseeing. There are other animals found here too, like wild elephants, spotted deer, hog deer, barking deer, wild pigs and a variety of birds. Bijrani Zone : This zone is the most visited by day safari tourists. This zone is well known for its spectacular landscapes. The entrance gate to this zone is 2 kms from Ramnagar and is called the Amnanda Gate. Day jeep safaris are perfect to visit this zone. Jhirna Zone : Jhirna is another important tourist zone in the park. Its entrance Jhirna Gate is 16 kms away from Ramnagar city. Dhela Zone : This is the only area in the buffer zone, which is open to tourists in CTR. This zone opens at the Dhela Gate, which is 13 kms from Ramnagar city. This zone is rich in both flora and fauna. Durga Devi Zone : The Durgadevi Gate which opens to this zone is located at a distance of 36 kms from Ramnagar, on the north eastern boundary of the Jim Corbett National Park. This zone is famous for the variety of bird species found here. This makes it the most suitable place for bird watching. Elephant Safari : The breathtaking view of the lush green forests and grasslands of the park can be adored by an elephant safari ride. 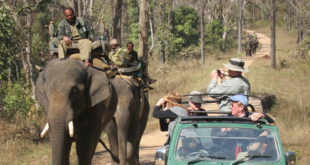 The wildlife adventure reaches to its heights when you opt for an elephant back ride, steered by the trained Mahout. For nature lovers and wildlife enthusiasts, it is a heavenly delight to roam around in the grasslands of the tiger reserve and do animal spotting, sitting on the back of an elephant. If you dislike the noise of vehicles, this option is the best for you to explore the beauty of this enigmatic place. Elephant safari rides are allowed only in the Bijrani and Dhikala zones, due to the tourists’ safety issues. This safari is conducted in two shifts – morning and afternoon. One can make advanced bookings from the official website of the Jim Corbett National Park and the tourists will be given the elephants on a first come, first serve basis. Open Jeep Safari : The park is the home to about 600 species of birds, 500 species of flora and a wide variety of mammals, reptiles and other wild animals. The most preferable way to explore the wilderness, here, is to go on an open jeep safari ride. Jeep safaris are available in all tourism zones inside the park, except for the Dhikala zone. Each jeep is provided with a driver and an expert guide, who throughout the journey, keep on giving you instructions and information about the park and its flora and fauna. Online advanced bookings can be done by visiting the park’s official website. 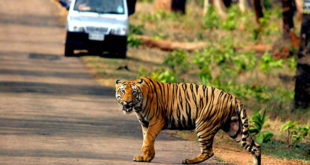 Before opting for jeep safari ride, you must have arrange a permit from the forest department. Canter Safari : The visitors opting for canter safari rides have the maximum chances to spot the Royal Bengal Tiger. 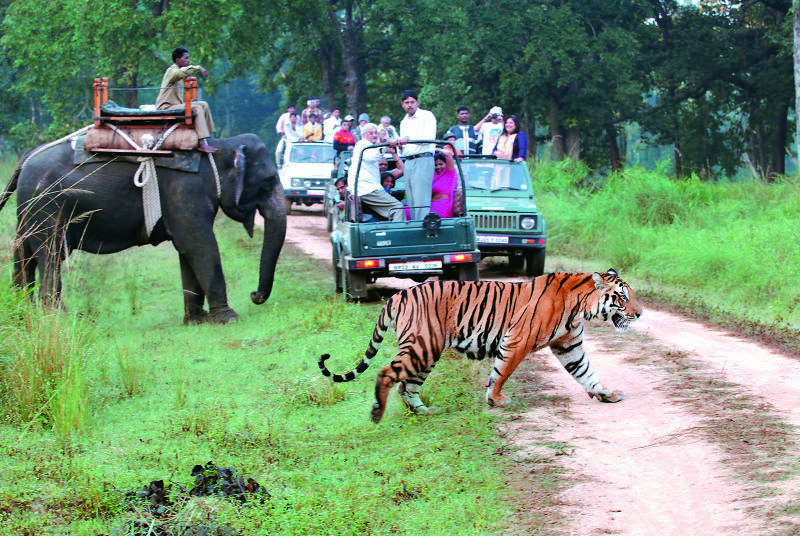 This is the most extreme safari ride offered in Corbett. This safari is allowed in the Dhikala zone, where you can spot the most number of animals as it is the core tourism zone, where day visits are not allowed. This safari also occurs in two shifts a day, the morning shift from 6:00 a.m. and the evening shift from 2:00 p.m., and the ride lasts for five hours. An expert naturalist, a forest gunman and a driver will accompany you along the ride. Special permits are required to go for a canter safari. Online pre-bookings can be done via the official website of the park. The Jhirna zone and the Dhela zone can be visited throughout the year because of its versatile topography. The best time to go for a canter safari ride in the Dhikala zone is from mid November to mid June. The most suitable time to go for a jeep safari is from mid November to mid June. The Dhikala zone and the Bijrani zone remain closed during the monsoon season in India. The park is accessible by road from Delhi in just five to six hours. For safari rides in the tourism zones of Corbett, special permits are required which are provided by India’s forest department. You can make pre-bookings of your safari ride 30 days prior to your visit, if you are an Indian visitor. People belonging to foreign nationalities can make their bookings 90 days prior to their visit. You must carry your photo id if you are a foreigner.